Now, back to PT… It was fascinating, and a bit difficult, to watch Dan explore Colten. 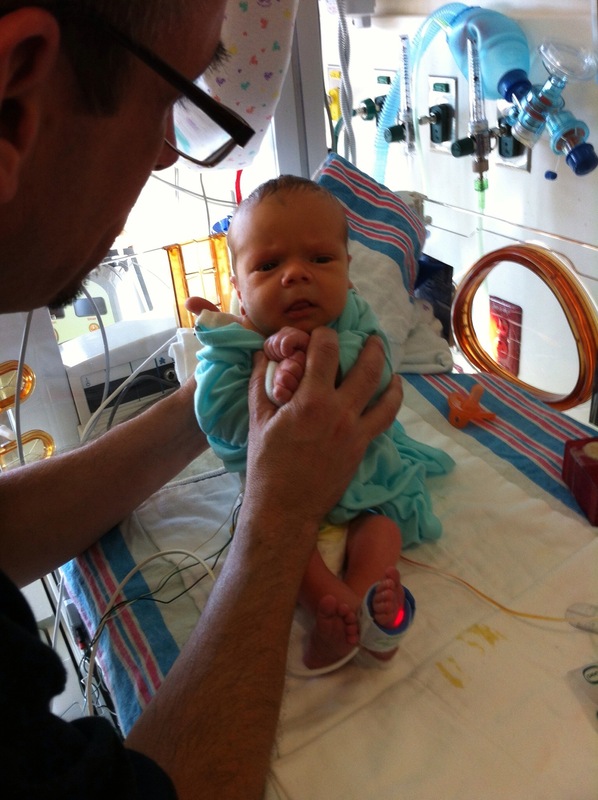 He started with a lot of muscle and sensory testing. He would push and poke and pinch different areas to see what sort of response he could get out of Colten. He did some stretches to see what sort of baseline angles Colten could move his legs and feet into. The dermatome testing was the most intriguing. He would pinch an area on Colten that corresponded with a certain level of the spinal nerves. If a response was received, those nerves are in good shape. No response? Bad nerves. So even though we already had a handle on where Colten’s defect was, there was a comfort in Dan also finding that L3 seemed to be the location. Based on Colten’s responses today, here’s the good list / bad list. So what does that mean? For now, it doesn’t really affect him, since we’ll be carrying him around anyway. As Colten begins to get to a crawling age, he will most likely find an adaptive and creative way to crawl. At around nine (9) months of age when babies begin to stand, he will work on standing with the aid of braces (at a minimum a Knee Ankle Foot Orthosis – KAFO) and other assistive walking devices. 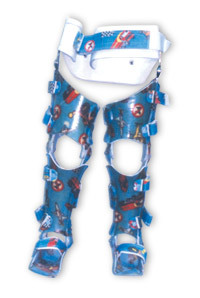 At around twelve (12) months of age when children start exploring walking, most likely he will need a Hip Knee Ankle Foot Orthosis (HKAFO). Picture Forrest Gump’s “Magic Shoes”. Because he has little to no response in the hip extensor muscles, his chances of walking are slim to none without any assistive device. With aids, hard work, upper body strength and will, he might be able to walk with braces and orthosis. He addressed Colten’s feet as well but has to meet with the orthopaedic surgeon for clarification on whether we will actually brace them or use manual manipulation and therapy to stretch them. If you missed a previous explanation of the issue, in short – it’s the opposite of club foot. Instead of going in and down, his go up and out. Getting Colten’s feet to point out/down past 90 degrees (flat-footed) is nearly impossible because his tibialis anterior muscle (front of the shin) are too tight. While loosening the muscle will allow his feet to provide some stability during the use of an orthosis, he still won’t have use of the muscle. Dan, the PT, said that most of the kids he works with that have similar leg/hip function, or lack thereof, will often go from various devices and/or orthosis to a wheelchair simply because they can be faster and more independent. 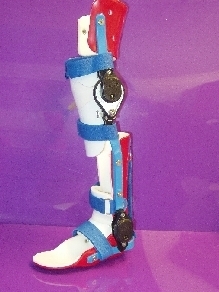 The orthosis is cumbersome, requires a great amount of energy, can cause sores and pains, and takes extra time to move around. A wheelchair allows the child/teen to move about more freely at a community level in a more comfortable setting. There still are moments of grief and sadness for Richard and I as we think of what Colten will go through during his lifetime, and what we will endure alongside him. It’s a roller coaster of wanting to feel empowered and helpful, then feeling angry and sad. So while we certainly won’t take anyone’s word about what Colten can and cannot do – we’ll let him show us, we have a better understanding of the future in front of him and how things could possibly progress and what’s in store for us to test and explore with him. Dan also shared with us a great story of a young man, now 25, with myelomeningocele at an even higher defect level than Colten. I won’t retell the story but suffice it to say that the moral hit home for us: treat Colten as you would your other sons. We need to demand the same from him as we do from Parker and Max. 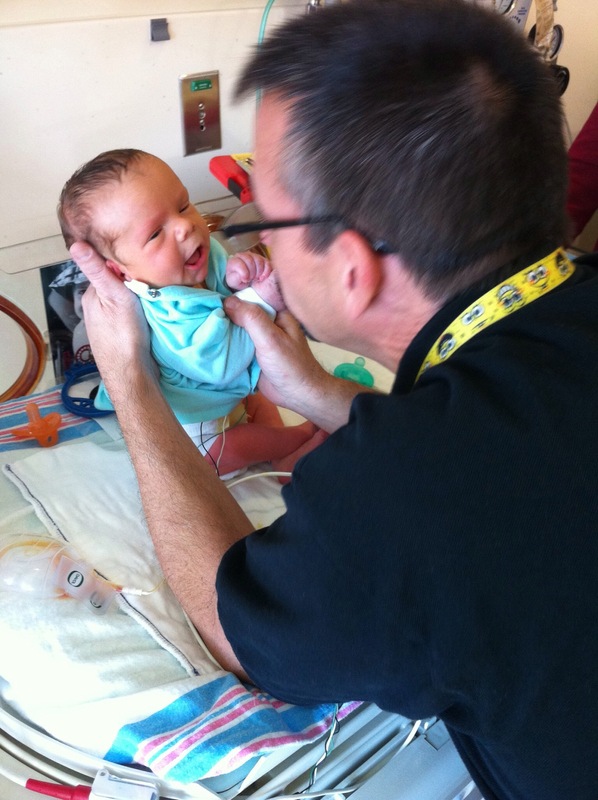 We must expect him to do things on his own and “figure it out” (a phrase Parker is already used to hearing!). Every child has challenges in life – some are harder or more frequent than others. But it’s our job as parents to help them find the best “me” that they can become. The rest is up to them.